This box at the North end of Kingscote station was not in use by the Bluebell Railway when I took this photo, the railway had not yet opened to East Grinstead. 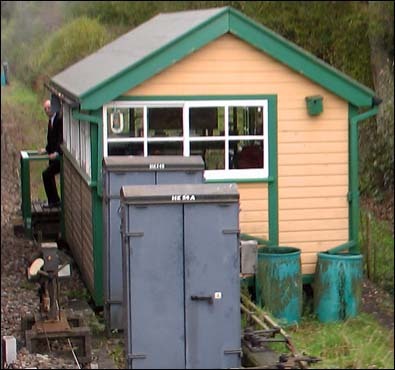 The signals were in place, but it would be 2016 after the the railway opened to East Grinstead that this box was to fully take over from the box (Cabin) below. This signal box or cabin was from Brighton Upper Goods Yard. It has a new brick base. This the cabin was built here in 1996. It was to be 2016 be for it was fully in use and the small ground frame cabin taken out of use in the photo below. There was a small cabin was built over a ground frame at the south end of Kingscote station. This photo was taken from a moving train in 2006. The signal man gives some idear of its size. This box was in service between the 27th April 1996 and closed on the 5th February 2016. 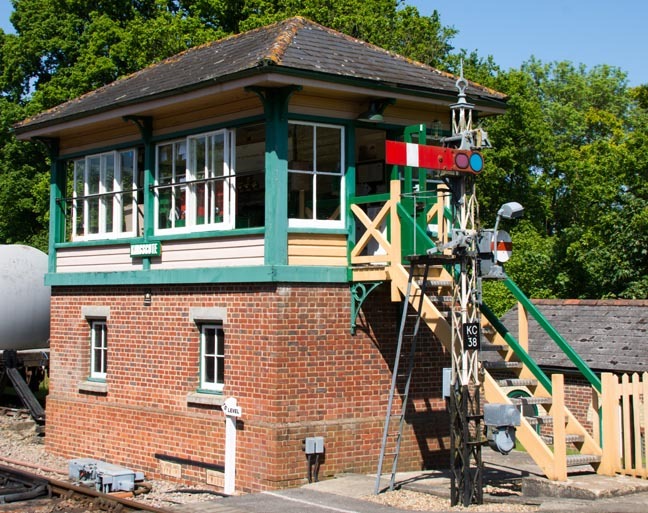 Signal box at Kingscote station in May 2018 in use and the railway open to East Grinstead. The Bluebell Railway was the first standard gauge railways to to be reopened by as a preserved railway in the UK. It ran only from Sheffield Park to the small Bluebell Halt at first. Then for a number of years it ran between Sheffield Park station and Horsted Keynes. Trains then used to run from Sheffield Park to Kingscote. 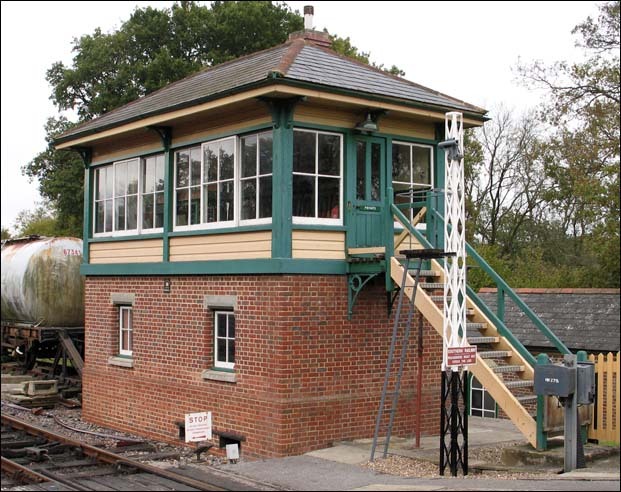 This page is about the Bluebell Railway.Signal box at Kingscote station. Today Grand Central GBRf and Greater Anglia are just some of the names on the trains.. These names keep changing, but that means I have to keep taking photos. I also take photos of preserved railways with steam diesel and electric trains.There is lots more to add and I keep taking More!